High grade congestion in the region of the vena cava superior. 56 year old woman, who was found to be always healthy till now, but for one year complained more and more of incremental respiratory problems along with mutations in her complexion up until the considerable disfigurement portrayed in the picture. The illustration shows specifically the gauntness and sagging of the cheek region, the edema of the upper and lower eyelids, the latter of which form two enormous bags that distort the face beyond recognizable condition. 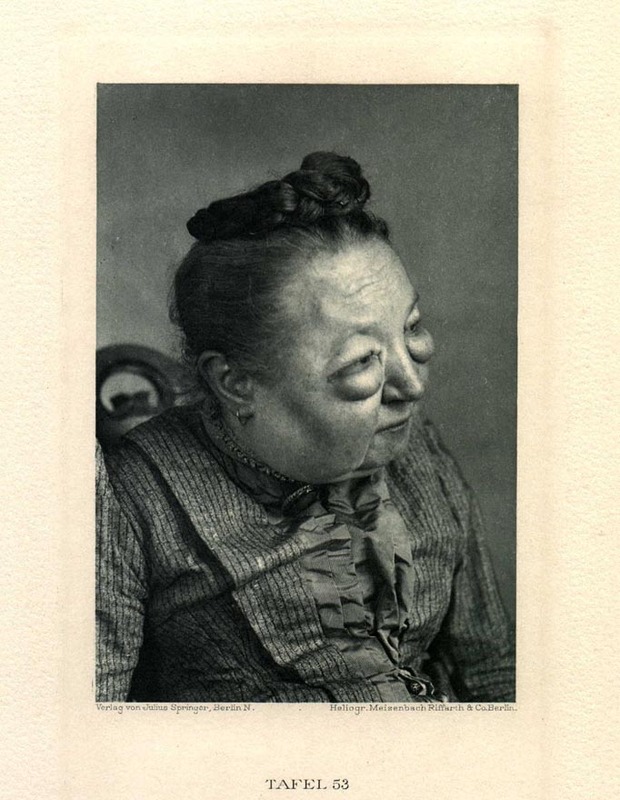 Apart from the edematose swelling of the face, an enormous cyanosis contributed to make the look of the female patient almost daunting. As for the cause of the congestion, it resulted from a very severe kyphosis of the back and neck vertebrae. The latter had become perfectly unmoveable, and had led to such a strong inflexion of the head towards the front, that the chin constantly pressed against the manubrium sterni and an existing struma had became forced against the large trunk vein of the neck and the trachea. Sectioning showed the trachea to be evaginate, oblate and soft. Death was incurred suddenly under symptoms of asphyxia, when the female patient had quit her bed against proscription (sudden perfect closure of the trachea).